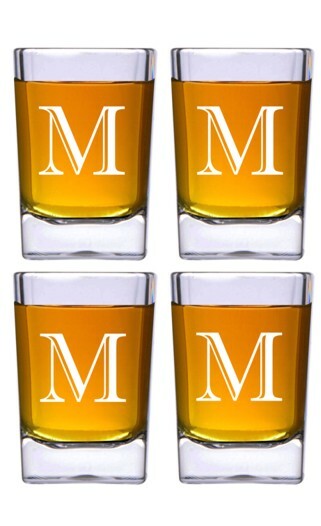 Don't let your guest be empty handed when they come over, spice up the night with this set of four square shot glasses. Can be personalized with any desired text. Be prepared for the next party! We personalize four round shout glasses with any text you desire. They'll be a great hit at any event. Personalization will be the same on all four glasses. 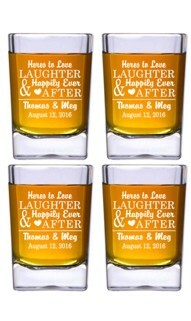 Celebrate Love and Laughter with the set of four square shot glasses. We personalize the four glasses as shown with the saying along with the couples names and date. 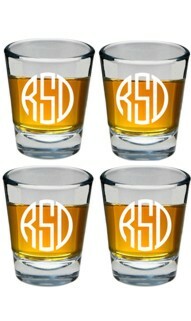 We personalize this set of four round shot glasses as shown. You will receive one for the Bride, Groom, Maid of Honor and Groomsman, a perfect momento of your special day. 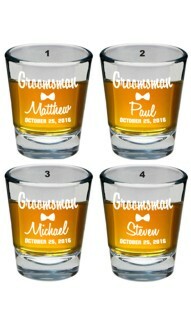 We personalize this set of four round shot glasses as shown, each with a Groomsman name and wedding date. It will be the best way to celebrate your special day. Pass around of shots at the wedding party with these personalized Bridesmaid shot glasses. They will remember what great time they had each time they take a shot for years to come. We personalized the four glasses as shown, with a Bridesmaids name and the wedding date.